Name-a-Dot is one of those exercises you can do away from the bass. Takes one minute or less and the pay off is huge. How fast can you do it with double flats? Hello! Welcome to Bass Bit #5! Today is all about connecting the dots – the dots on the fret board that is. Obviously, they are there for orientation. Some basses start with their first dots right here on the first fret. Most basses start on the third fret, and then it’s usually third, fifth, seventh, ninth, and then two dots on top that mark the octave. Now some basses have twenty-four frets so this whole thing will repeat. Some have a few less than that, some even have a few more than that but basically the pattern will always repeat and help you orient yourself and find your notes and here’s a great exercise for you. Could I say that using sharps? Yes I can: [playing: 1.45 to1.51] G – C – F – A#; A# – F – C – G.
I could even do this: [playing: 1.53 to 1.58] G – C – E# – A# – E# – C – G.
I could even do this: [playing 1.858 to 2.04] G – B# – E# – A# – E# – B# – G.
[playing 2.16 to 2.23] Abb – Dbb – Gbb – Cbb; Cbb – Gbb – Dbb – Abb. Gx – Cx – Fx – D#; D# – Fx – Cx – Gx. Now, the double flat. How about that? [playing 2.51 to 2.58] Bbb – Ebb – Abb – Dbb; Dbb – Abb – Ebb – Bbb. Next stop: [playing 3.02 to 3.14] B – E – A – D – D – A – E – B; – Ax – Dx – Cx – Cx – Gx – Dx –Ax. Flats: [playing: 3.16 to 3.22] Cb – Fb – Bbb – Ebb; Ebb – Bbb –Fb – Cb. Next stop: [playing 3.27 to 3.40] C# – F# – B – E; E – B – F# – C# (also known as Db, Gb). And then Cb and Fb if you want: F – Cb – Gb – Db. And then we can do this whole thing with double sharps: [playing 3.47 to 3.53] Bx – Ex – Ax – Dx; Dx – Ax – Ex – Bx. Db: [playing 3.58 to 4.04] Db – Gb – Cb – Fb; Fb – Cb –Gb –Db. That was not that hard as they are all single flats. And we have the double dots: [playing: 4.10 to 4.22] E – A – D – G; (just like the open strings) G – D – A – E. Or, Dx – Gx – Cx – Fx; Fx – Cx – Gx – Dx. And, we have the flats on this one here: [playing: 4.28 to 4.34] Fb – Bbb – Ebb – Abb; Abb – Ebb – Bbb – Fb. So you can see, this is quite some mental acrobatics! 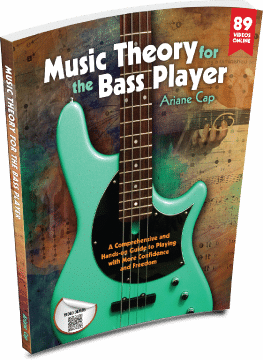 But it helps you think about the bass in different ways, helps you shed the notes even if you don’t have the bass at hand. I think it’s a great exercise. And once we know the dots, obviously you’ll get faster and faster and faster in deducting where all the notes in between are. If you know this is a [playing: 4.52] C, that’s a [playing: 4.53] C#. If we think about double flats, flats and sharps and so forth a lot, we’ll get really fast in doing this and it’s useful. So, enjoy! Let me know what kind of results you’re getting. Please comment. Let me know how it’s going. If you have any questions, you can find me at the Contact Me link. Alright, thanks for watching. Hi Ariane, This maybe the best bass bit so far. Talk about brain freeze! Can you let me know what metronome your using. It has a nice crisp click. Iam tempted to throw a bass neck in the car to work on this stuff away from the instrument. Hope you had a great holiday. Thanks. Cheers, Vinny, thank you. Good idea about the bass neck 🙂 The one inside the brainbox is always there, so that really works, too. The metronome I am using is the Korg KDM-2 Digital metronome. I like it because it has all the options I need, has big handy buttons and as you say, pleasant clicks I have to stay away from the smartphone which is distraction City. It’s incredible how I improved with this first exercices from the book and videos. At first was quite difficult because I never use the english notation (ABCD…) but now I have a huge idea of the instrument, notes, etc. This Bass Bit is great. And by the way, Diego, I can relate to your comment about English notation. In German we have a few differences to the English system too. Most everyone uses the English system, however, so I think it is worth learning. Thumbs up!! Such a great first lesson today! I’m so excited I’ve been shedding for an hour already tonight and I can’t stop but I must so I don’t hurt myself and then I can get back at it again tomorrow. I really find the dot exercise fun and a good mental challenge. Thank you! Hey Tony, nice to meet you, neighbor. Small world 🙂 Happy shedding!